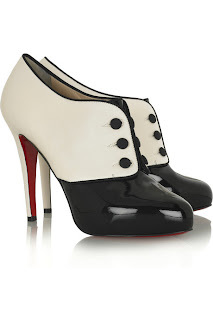 It's been too long since I've indulged in some Louboutin Love. Alors, behold these lovely almost shoe boots. The 1920s styling could give the impression of being a bit unworkable but I reckon they could be worn with a multitude of outfits - trousers, jeans, skirts, dresses. Which is a good job really as they do cost £620 so you'd want to get your money's worth really. Love these! Would look perfect with my new LBD!